A commissioned piece for this idea from the Warlords mod. Talking to evillejedi (the original designer), the ship was an idea for a late-Republic torpedo sphere sort of, with secondary fleet functions. Long and thin to minimize profile and a heavy warhead system. I’ve taken that concept and developed it a bit, with the main missile battery in a fixed and separate annular compartment away from the hull. Power should end up being ~2-3 ISD, so barely a cruiser, which is fitting given the very thin hull (I expect the reactor to be fully buried). Fast, well shielded, but not a slugger. Could you please tell me what the length, weapons, and fighter capacity of this plane is? I have to say I’m amused how controversial this design is. The reason given for the “free floating” ring instead of the solid part built into the superstructure is that in the case of a catastrophic damage of warhead detonations, it would explode away from the ship’s superstructure and not into it. You think you be able to reuse the hull for another design? Yeah of course – just yank the ring and fill out the hull form. Fair enough. I knew there was a reason you did it and trust me I know the changes I talked about aren’t exactly a quick fix. I definitely like the ring as a design element and think it’s very EU/Dark Empire. Just the slope bothers me. It’s similar to how I like Porsche Panameras but the rear end was just a little off on the first generation. Your VSD is best I’ve seen btw. I actually like it, it’s a break from the traditional battle-wedge and the ring makes sense once context is given. The only thing that stood out to me at first glance (in the first pic) was how the superstructure appear cooked since the ring is relatively “flat” (in terms of the front-to-rear) in relation to the ship’s angle towards the camera. Full agreement on this observation. I too think the ring structure added to it is what makes this ship class stand out somewhat and gives it a unique feature. 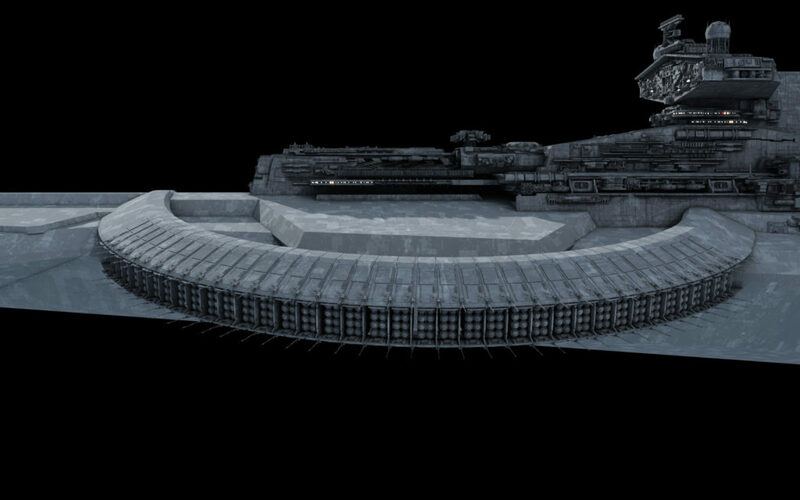 After looking even more closely at the general structure of the hull, I can see the “late-Republic” design influence despite the ill-fitting name of the class as the “wedges” or dents the hull has around its midsection where the ring is located on both sides is reminiscent of the dents the Venator has and the small ridge on the top is a nod to the Mandator series. I personally just don’t feel it completely gels with Imperial designs on account of the ring being perfectly circular. The idea of a ring in itself is fine, but if I were designing the ship (which, clearly, I’m not), I’d maybe aim for a more hexagonal design. Can the Missile launchers be reloaded? Beyond the missiles this ship also features 48 Venator-style Dual Heavy Turbolaser Turrets (24 on each side) so it can still dish out some punishment even when it has fired all its missiles. I’m also sure it has some medium cannons scattered around the hull and possibly some point defense emplacements against fighters as well. I think I know this ship class from the “Rise of the Mandalorians”-mod of Empire at War: Forces of Corruption. There it is called the Tyrant-class Star Destroyer and a sort of heavy missile destroyer which is yet faster than the Victory I-class. The circle-like missile-batteries in the midsection are certainly a creative idea and give it a sort of immediate unique appearance feature. I didn’t name it. If we went late Republic KDY perhaps Funditor/Sagittor? Yea, it’s named like it is in the original source. Funditor or Sagittor would also work well for the Republic variant. Funditor is another word that means “thrower” in latin and Sagittor comes from Sagittarius, the archer, which also fits this ship’s main role. I’m just grateful you even make such fanon designs as your take on it often improves the original design in terms of quality. I quite like how this turns out. I like it! 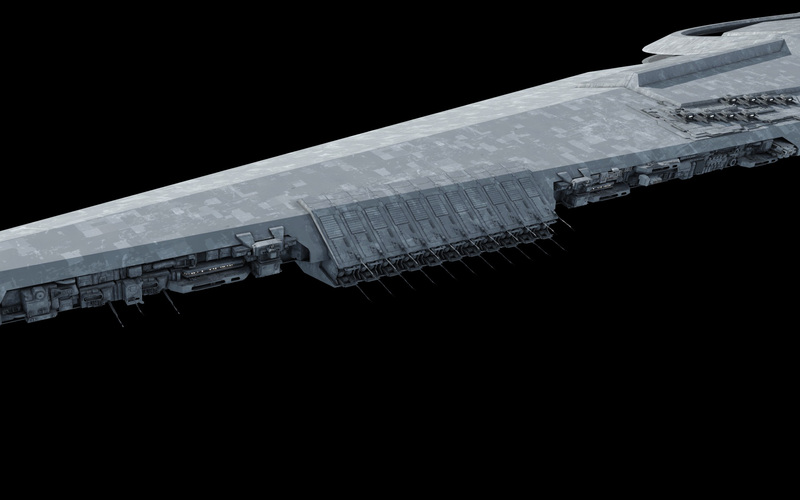 Let’s be honest – most Star Destroyer derived models look more or less the same. This one is a good mix of deviation and recognition factor. By the way, may I ask what is the class system in use here? It clearly isn’t a cruiser from the Anaxes war collage system… I’ve heard its in relation to modern ship classification with its size ratio, which makes the most sense in this case, just looking to confirm. As I understand it, it’s pretty much standard wet navy classification (c.a. WWII) applied to space ships with the ISD being a typical destroyer. It’s worth pointing out that the Separatist classification system is very close to what is used here. 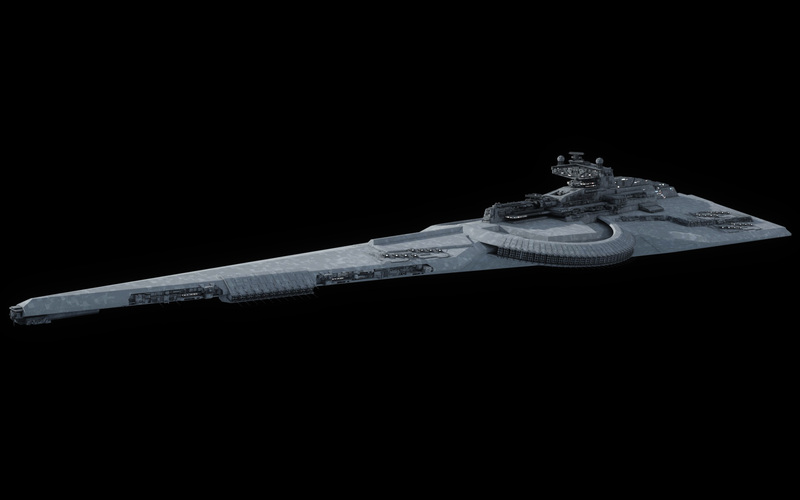 The Munificent is a frigate, the Recusants seen in ROTS are light destroyers, the 2,544 meter long Recusants that appear in TCW are simply called destroyers (in the episode “ARC Troopers”) and the 4,800 meter long Malevolence is a Subjugator-class heavy cruiser. That is a whole heck of alot of beat down. As much as I like your work are there any NON-Imperial ships coming up on the docket?? Dauntless/Marsheem-Class, the forked Liberator-Class or the Aggressor-Class Destroyer?? I would love to see a conventionally armed Aggressor without that giant Ion/Plasma cannon. The fastest way to see one is to commission Ansel to create one. The bridge tower stands out far more on a standard ISD than this ship. As a percentage of ship volume and height, this bridge is downright inconspicuous compared to a stock Imperator. In a nutshell, barraging a target with more missiles than its shields, armor and point defenses can intercept/deflect. Do you think the silos could be configured to launch Stormtrooper drop-pods? They look to be more than a deck’s height in bore, so it’s not completely out of the question size wise, but they may not be accessible to crew. This is a commission for a ship that already exists in a computer game mod. It’s likely that Fractal doesn’t have much freedom to make big changes in the basic design or shape. I see. Hopefully the mod developer will see my comment and take my suggestions into account. I really like the overall basic shape of this design, but it has some problems. They could be some easily fixable problems, but overall I think the ship design would be better off otherwise. So if you can do better, let’s see it then. At first, I was like what the heck is this, but now I keep finding myself drawn back in to keep looking at it. I like it, it’s very Imperial looking but at the same time it isn’t. I’ve always wondered if an Impellor-class ship could also be used in this sorta role, like if the forward prongs were retrofitted to carry missile batteries instead of hanger bays. Very unique ship and concept, though I got a few questions: if it’s primarily a warhead reliant ship from late-Republic era, how does it got more output than an ISD? (I always thought ISD were cutting edge at the time of its release) Also what does it need 2-3 ISDs worth of power generation for? Aforementioned shields and speed? Count the heavy turbolasers. 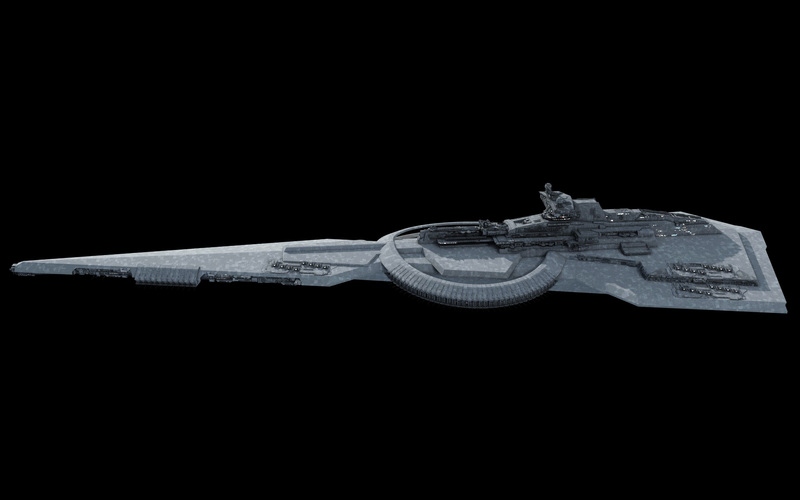 Looks like the same as on the Venator-class but 48 of them instead of 8. Fractal estimated the 8 turbolasers of the Venator with a yield of 70 teraton a barrel, and the turbolasers of the ISD-1 on 175 teraton a barrel. Giving this ship a turbolaser output of 48*2*70= 6720 teraton. While the turbolasers + ions of the ISD-1 have a primary weapon output of 2800 teraton. I like the overall shape, long and thin, just something about massing of the ring seems off to me. I almost think the ring ought to be a solid short cylinder and not a hollow ring. 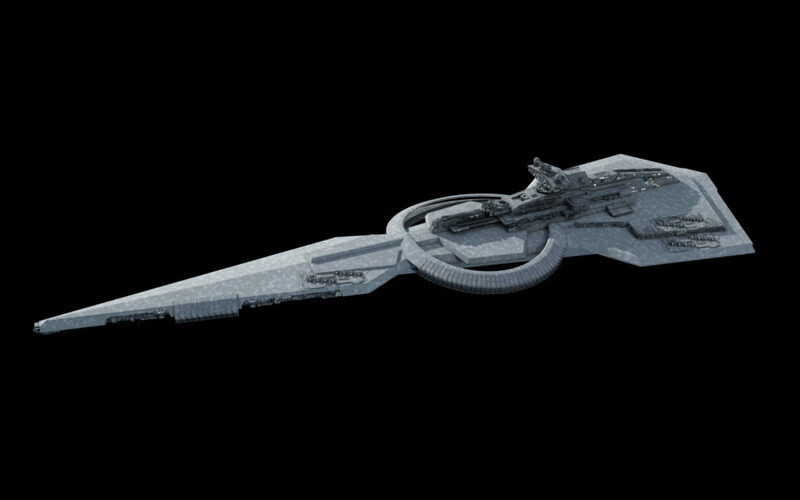 More like the modular task force cruiser from DE. Maybe positioning it higher vertically too so it’s even less imbedded in the main hull. I do think more antennas would be a good idea too. I love the way they looked on your VicStar. What sort of a support ship feeds this beast? Given the size of those silos, and e slenderness of the hull, it would seem likely to only carry a reload or two, and might need some munitions carrier to follow it about to provide enough ammunition for a prolonged bombardment. The ring does not rotate – it’s purely to get the launch cells away from the hull, so if there’s a shield penetration and hit to the magazines they’ll blow outward and away from the main hull rather than into it. Hey, so even the Imperial Navy finally got around to upgrading from MK41 to MK57 VLS. Good for them. I’m seconding the notion for more sensor globes as well. Looking forwards to seeing how this one progresses. I wonder if this thing was built on a fleet light cruiser hull that omits the missile ring and fills in the wedge with conventional warship hardware. Having the missiles be externally mounted is a fascinating concept, but it looks highly vulnerable to me with all that empty space between the ring and the hull – not to mention a perfect spot for a fighter to dive in or launch a torpedo at and being pretty irritating for maintenance crews who’d have to do EVA. I wonder if simply actually having it Mk57-type – attached to the hull for ease of access, no blind spots, etc, but armoring heavily *behind* the missiles and the missile bays themselves – would prove to be more efficient. I suspect that amount of armour would cause an unacceptable increase in mass, leading to an unsatisfactory thrust:mass ratio. If I’m correctly interpreting this ship’s role, it should (in fleet combat) have the majority of the fleet’s point defences and fighter complement between it and any enemy fighters which wanted to try it. If you’ve ever read Weber’s Honor Harrington series, he proposed a novel way of maximizing a ship’s missile salvo while maintaining protection called a Pod-layer. Instead of mounting missile racks or VLS cells on the outside of a ship, a warship would instead have a hollow core filled with missile pods. Those pods would then be launched out of the back of the ship in combat, and use the ship’s sensors for targeting data. Perhaps it doesn’t quite feel like Star Wars, but an intriguing concept nonetheless. 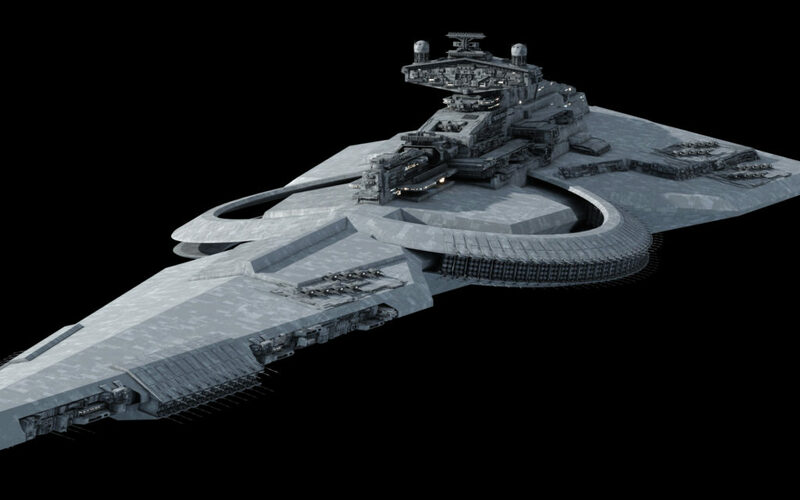 It wouldn’t be too hard to do for Star Wars; just a matter of how big the pod would have to be and how many starfighter deck slots a ship would have to sacrifice to carry it. A lot of the technical restrictions that forced the development of pods in the Honorverse (particularly the gravity wedge drives) don’t carry over into the SWU. I didn’t think about that but it does make a lot of sense given the size of the warheads. wait I have reloaded the page and now it shows up normally. Still not getting notified was weird. No I’m on my PC. I didn’t get notified of your answer either and after checking my email again it turns out Fractal’s response ended on the “promotional” section. Don’t know why because the first time I posted here it was fine, I think it was on “social”. It does that for me in Chrome when I move my cursor over the message. One missile per silo or a cluster of missiles in each? Either/or, depending on size. For siege work probably one big one per cell. Wow. That’s 320 individual tubes on each side of the ship if I got the count right. I don’t imagine this thing has anywhere near the magazine capacity of a Torpedo Sphere, but it wouldn’t need to: basically a drive-by bombardment platform to make a high-speed run past a target like a real-world WW1/2 era destroyer. By rotary, are you saying that the tubes move in the mount, ala the turbolasers on a Hapan Battle Dragon? I honestly have no words for this just yikes! Anyway what it’s length? It look like it is between 3-4km. Also will the name Tyrant be it’s class name or not? Jaunty and rakish like a mofo. The Imp Star bridge is a little jarring, but taking in the overall profile and economies of scale, I can see why it makes sense. Fantastic work regardless. I agree about the bridge. From a distance it looks fine, though up close it looks kinda weird. 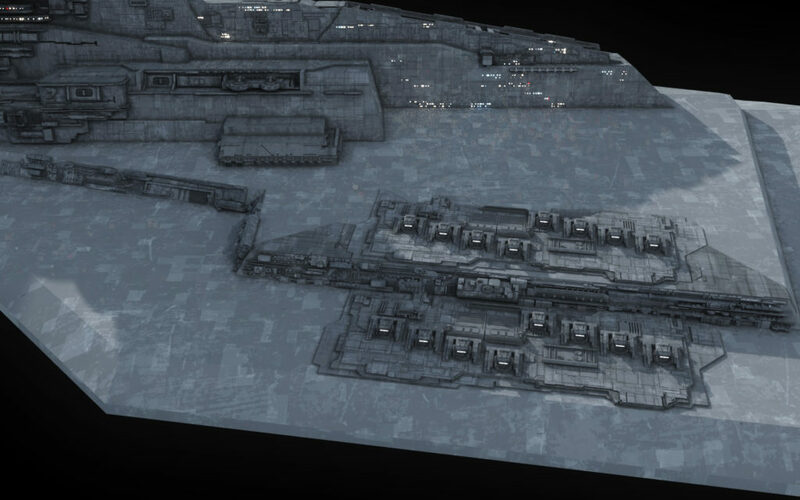 If it’s an old Republic design, if Fractal wanted to he could go with a single Venator-style bridge instead. I don’t think so. It’s in between a Vic I and ISD, maybe, but closer in scale to the ISD.